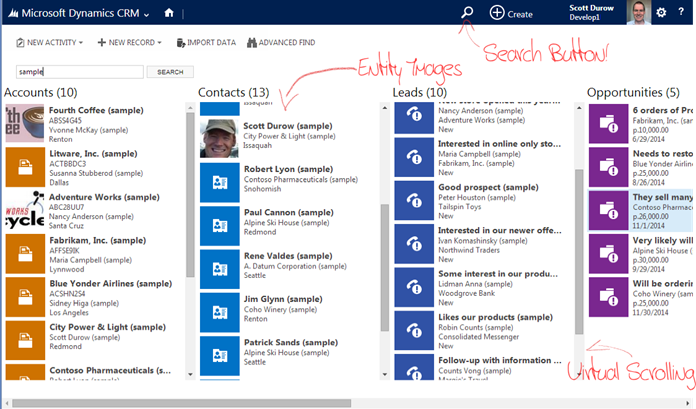 I've just published an update to my Multi-Entity Search Solution (after being encouraged by my friend and fellow Dynamics CRM MVP Gus Gonzalez!). Search across multiple entities at once. Uses the same configuration as the mobile client 'Quick Find' (Settings->General ->Set Up Quick Find). This allows you to select which entities you would like to search across. Virtual Scrolling with new records loaded as you scroll rather than all loaded at once. Shows the primary entity image of returned records (if there is one) in the search results. A search button added to the top navigation bar* rather than using a Command Bar button. *Since there is no supported way of doing this, I've had to do a little DOM shenanigans to get this to work the way Gus wanted! If you like this, you might also like to check out my Start Menu Navigation for CRM2013!